Ibiza – A picturesque island in the Mediterranean sea that boasts jovial nightclubs, quiet villages, and serene beaches. 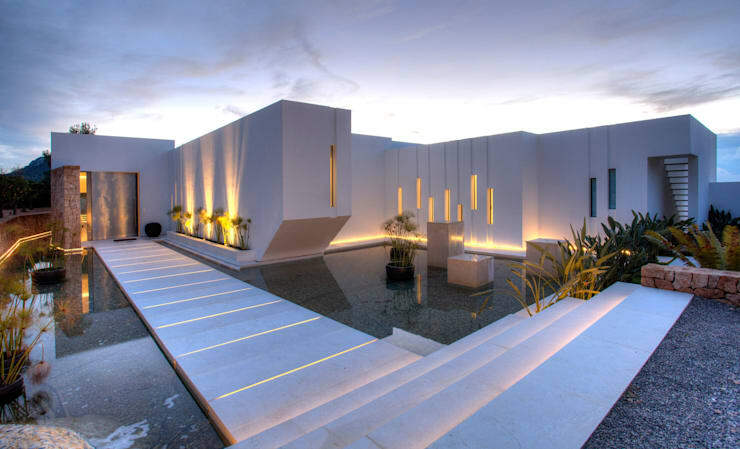 And today, it has one more element to add to its list of beauties – a modern dream house that’s designed to perfection. 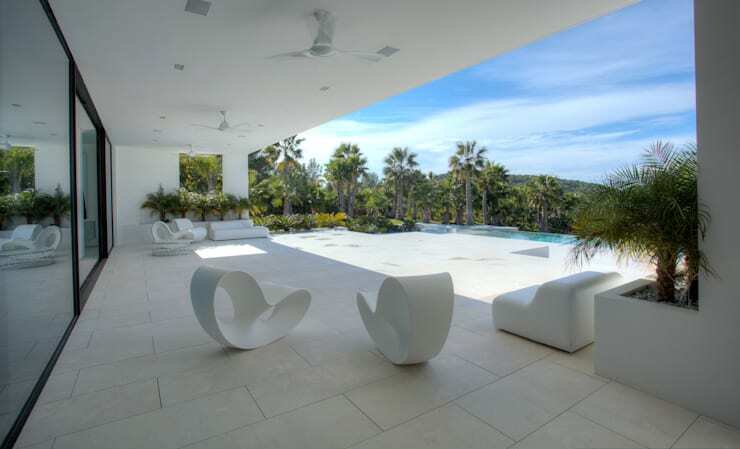 Spanish professionals MG&AG Architects set out to create a fantastic design with fine luxury and breathtaking views. Ibiza superbly takes care of the views part—after all, how many houses provide panoramic outlooks of clear skies, green hills, and a turquoise blue sea? A delightful mix of modern design, luxurious style and futuristic touches collide in a dream-like vision. With its clear, reduced design and gleaming white façade, this villa adapts to its Mediterranean surroundings most superbly. Notice the warm and striking glows illuminating through the slim windows from the interiors. A stunning concrete path leads us to the front door, made from perfect stainless steel. And just the right amount of foliage, water and gravel ensure touches of nature to enhance this outstanding beauty. We here on homify 360° are used to leaving the swimming pool view for last, but in this instance we simply cannot wait any longer. Behold a majestic night vision of striking excellence! Cool, bluish glows rise from the pool’s waters, offsetting the white lights from the villa quite brilliantly. And what a swimming pool that is… not only do we have generous space for practicing laps or just splashing about, but there’s also built-in lounges in the pool for those who require the utmost luxury for their tanning environments. Tropical sunbathing has never looked this good! 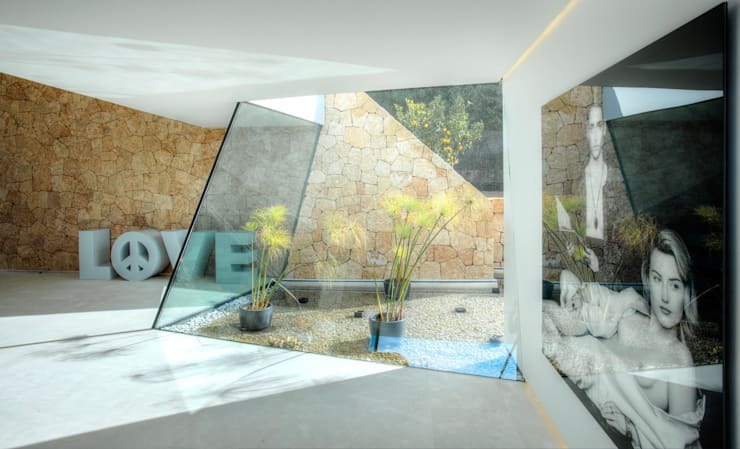 A villa that sports tropical views simply cannot divert the residents’ and guests’ eyes from it for too long – hence the generous portions of glass on the insides. Pictured here, we have a remarkable window section to allow natural lighting from outside to flourish freely in the interior spaces. A remarkable combination of crisp white marble and warm beige stone adorns the interior spaces, resulting in a light and open atmosphere. We keep dwelling further inside the villa, and the views just keep getting more impressive. 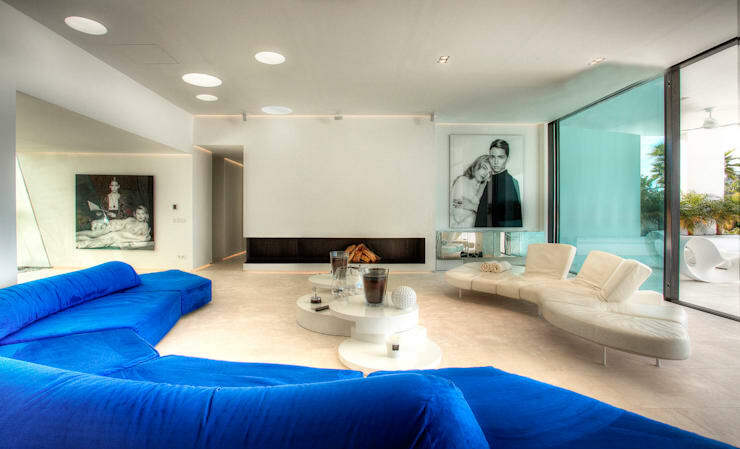 Here we have the living room, presenting a strong link with the breathtaking surrounding landscape. It’s as if those sliding glass doors don’t even exist. A royal blue sofa (mimicking the tranquil shades of the sky and sea) presents the perfect spot for an afternoon post-swim nap, or to just sit and catch up on some gossip with a friend. And don’t overlook that dramatic fireplace, which is sure to cosy up even the gloomiest of winter/rainy days in this striking setting. The kitchen presents its fair share of spectacular views – how many cooks can boast about having ocean waves as a backdrop while preparing dinner? 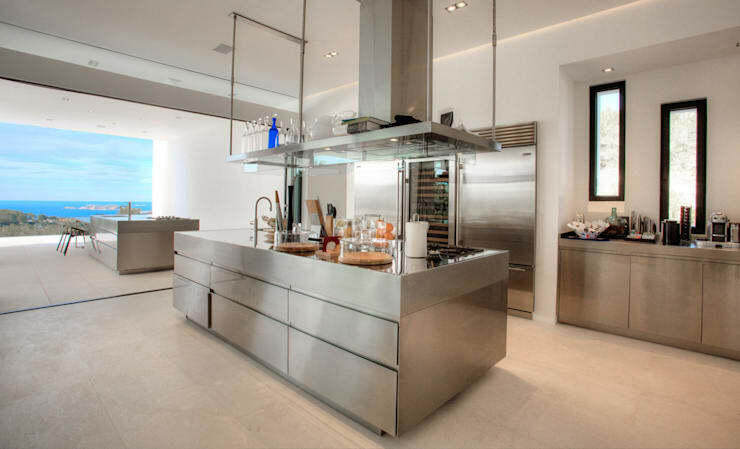 Stunning stainless steel was chosen for the appliances, ensuring a highly modern and industrial flair. And for those who prefer their pasta to be both al dente and al fresco, a grilling/cooking area has been set up on the terrace outside. We all know that the kitchen is the heart of any home, which is why we have prepared: The Simple Guide To More Spacious Kitchens. The kitchen flows freely into the dining room area, allowing for an open and welcoming floor plan. Where the kitchen opted for a more rigid and linear approach, the dining table decided to be more free-flowing – just see that remarkable combination of modernist wood and gleaming mirror! Who says you can’t get creative with your dining set? 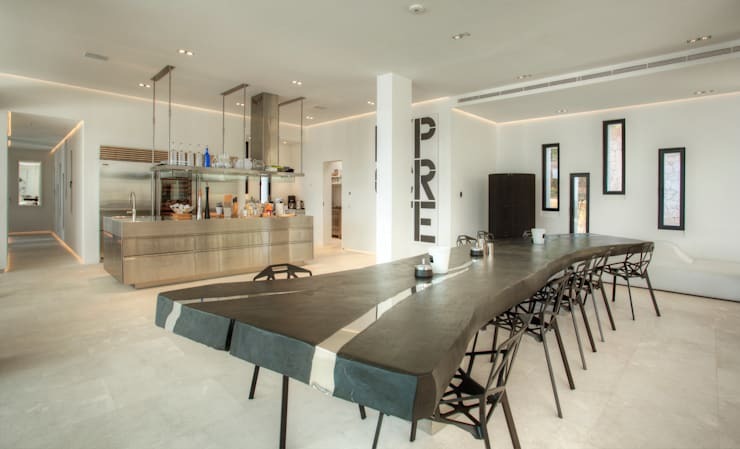 See some more examples of the striking dining rooms here on homify. If one gets to swim in luxury, then surely one must bathe in it too? It would seem the architects had the same notion when they designed this bathroom. Floor-to-ceiling windows ensure stunning views of the tropical landscape, plus golden sunshine by day (and starry ambiance at night). What stands out more perfectly here? The oval-shaped bath? The clean and crisp colour palette? 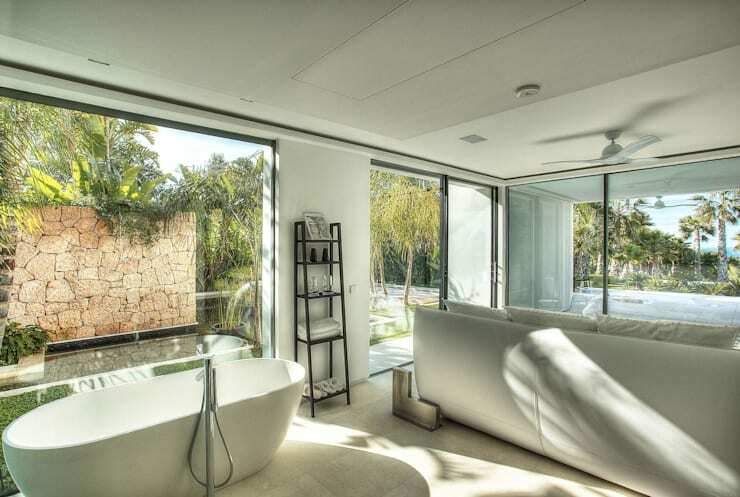 Or how about the fact that the bathroom shares it space with one of the bedrooms, also coated in a tranquil white? On to one of the other bedrooms, which is reminiscent of those peaceful summer afternoon naps after an eventful morning of sun, sea and surf. Clean lines and off-white palettes ensure a spacious and clear environment, and also work beautifully to reflect the natural light pouring in from the windows and sliding doors. And for those who wish to work on that best-seller (or check their emails), there’s even a small working space, complete with bookshelves just waiting to be stocked with novels and magazines perfect for summer reading. After a tour with so much luxury and exquisiteness, it’d be wise to have a sit-down on a gorgeous terrace overlooking a spectacular swimming pool – with a splendid tropical view on the horizon, just to be safe. And what luck! We can either get comfy on one of those ultra modern chairs (wouldn't want to spill our cocktails, of course), or opt for lounging on the white couch with a good book. Difficult choice, indeed!